Discussion in 'Console - 505 Games/Pipeworks Studio' started by Deanzor, Dec 15, 2015. So I got the Dragon Armor and I noticed something off with it's stats. The Mask says it boosts critical chance by 15%, but it only boosts it by 10%. The Breastplate says it's supposed to boost critical by 10%, but it only boosts by 5%. So instead of the 25% critical chance the wiki says the set is supposed to give, it only gives 15%. Is this a bug? If so, will it be fixed in the next patch or the patch after? It's probably a visual glitch. That's like the thing with my armor. I changed my chlorophyte armor with to turtle (while Sun eclipse) and it said that the Set effect is that leaf cristal that attacks enemies (dont Know in english). But the effect of the turtle armor was active, not chlorophyte. Did you have the thorns potion activated? Caught 31 Truffle Worms in about 15 minutes. 7 were killed in the process. I Put the armor off and on to see the normal effect. It's not the known visual bug, I've ruled that out. The crit% only goes up by 10% for the Mask and 5% for the Breastplate. Is there a point in the story were i have to be to get those Worms? Huh. Didn't even notice it looks like rain. But no, it's mushroom wall that spread onto the patchy jungle wall. 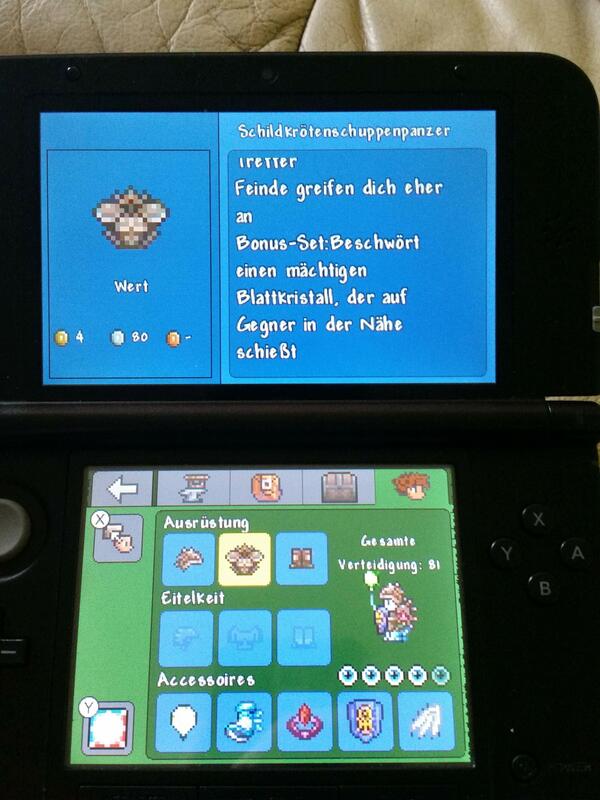 The mobile version of the game can have Truffle Worms spawn on surface mushroom biomes, but very rarely. The leaf crystal does damage, so its probably the leaf crystal doing the damage. surface mushroom biomes, but very rarely. Yes. 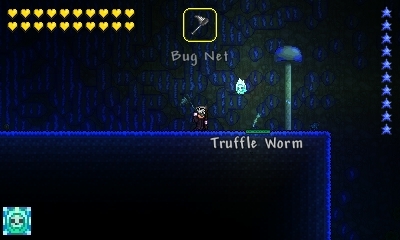 As far as I know Truffle Worms shouldn't spawn on the surface Mushroom biomes. At least, not intentionally, anyway. I've never tested that. I highly doubt that the King Slime trophy is in this version yet. It's probably not in for the same reason that most of the boss masks aren't in. Pre-hardmode i have eye, brain, Queen bee and wall. I'm looking for Slime King, eater of worlds and skeletron. Finally news on the NOA 1.03 patch release, it's arriving Monday June 13 at 0900 PT. I'm disappointed not to have it for you this weekend, but at least we have a date now. Look forward to hearing your thoughts next week, North Americans! Euros, you get yours tomorrow. ferofax, biotanma, PlanteraBlade and 5 others like this. Wahoo! Monday can't come soon enough! I squeeze my thumbs so Bad that my game is fixed after that..
YEEEES! Good luck on working on the next update! If my game is still broken after the update... What should i do/try?